Putting people in space ... or not? » Putting people in space ... or not? NASA has already made extensive use of remote-controlled machines for space exploration, such as with the Mars rover missions. 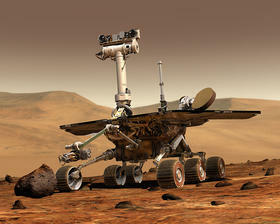 The rover Opportunity, pictured here, has explored the surface of Mars and analyzed its soil since 2004. When Opportunity finally breaks down, it will not require an expensive return trip to Earth. Sending machines to space is much cheaper and much less dangerous than sending people. Eighteen astronauts and cosmonauts have died during spaceflight—about 5% of all the people who have been launched into space. Including those who died in training brings the figure up to nearly 7%. If something goes terribly wrong on an unmanned flight, the machines don't die. Nor do they need to eat, drink, breath, or go to the bathroom. They don’t get stressed out or tired. They don’t need a narrow range of temperature and air pressure to function. All of this makes using machines in space less risky and a lot cheaper than employing human astronauts. As machines are increasingly able to match the versatility of humans in space, some people feel that human space travel should be left to private organizations, while government-funded space exploration and research could and should be done entirely by unmanned, remotely operated spacecraft. In an unmanned space program, robotic probes like Stardust could analyze planets and stars from orbit, wheeled rovers could explore planetary surfaces, and fine tasks could be done by remote controlled or automated robots, similar to NASA's Robonaut. So what do you think? Should humans explore space in person, or should it be done by machines? Vote to let us know your opinion!